Have you found an online vendor selling Tiburon Small Batch? My friend owns a second home in Belize and brought me a bottle of this as a gift. The packaging is very nice, with a shark tooth hanging on the neck of the bottle. The nose is rich and sweet, and the taste is sweet molasses, albeit a bit rough on the edges, like the finish. Maybe this one would benefit from a bit more time in oak? Nonetheless, a very nice dram! This rum brought me back to exploring rums. Not sold in Florida anymore, but I would love to always have two bottles on hand. One for sharing and one to offer up as a gift. A clean and fresh flavour with subtle vanilla notes but not exactly memorable. Belize isn’t well known for its rum, and the Tiburon offering is no exception. The price is on the high side for a rum that really doesn’t do well on its own as a sipper. Tried the Tiburon Small Batch rum at the Traveller's Distrillery in Belize City and this is no neat sipper, far from it. Very strong alcohol smell and taste and the burn is just awful. Mix it with Coke and you have a small hope left. It's Friday night and it is time for the rum review. There be a shark swimming in me bottle lads and lasses, but that's the way these guys roll, and seeing that Tiburón even means shark in Spanish. The tribal emblem is even a shark, not to mention the from what i believe a plastic sharks tooth attached to a cord around the neck of the bottle. So no ill fate befell any innocent sharks in the production of the packaging. 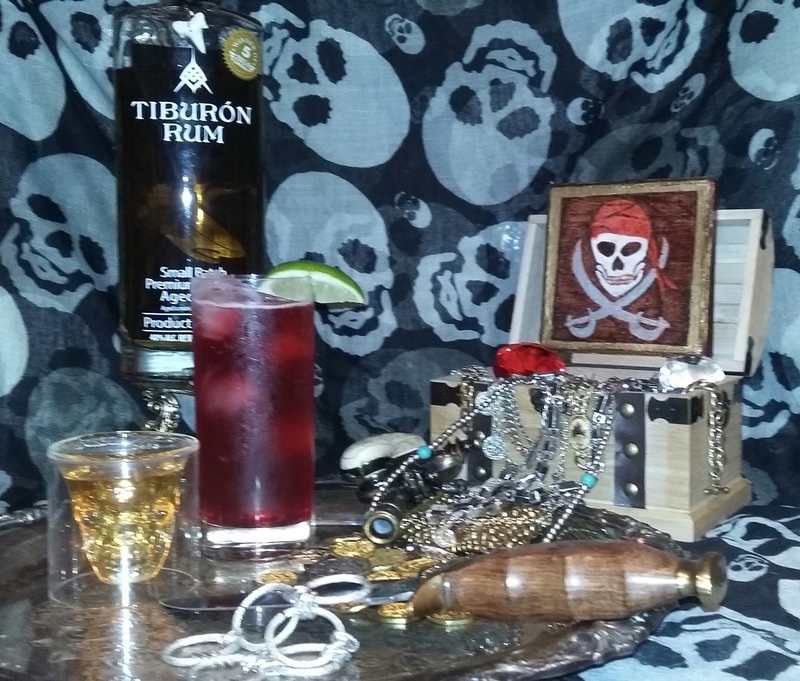 Tiburón is a brand of the Shark Bait Company in which is owned by Travelers Liquors Company, 80 proof and distilled n aged in Belize nearest the beaches of the southern Carribean. Fermented from a molasses base it is aged in Kentucky Oak Bourbon casks in the warm tropical breezes, for a minimum of 4 years is then blended and bottled for the next run ,their first being a whole 9000 bottles and with the American run being only a few thousand more. It is made in small batches and put stilled in copper. heather. It leaves quite a number of teardrop ending legs as the sheen slowly retreats back to the remaining spirits. To the nose my main impression is butterscotch and vanilla, yet subtle cinnamon are present as well. The entry is quite astringent while neat or even over ice is hard to make out any other flavors in the rum there is a very low level of cinnamon and vanilla bean. To be honest I'm thinking this is better suited for mixing than for sipping so on that here is what I'd recommend. Dirty Mojito, Tiburón and Cranberry or most clear fruit juices with a squeeze of lime. Even a Tiburón and cola or lemon/lime soda, even a ginger based soda would be good. From the mountain top of North Ga. Stay safe, stay alert, stay alive, and drink responsibly. Till the morrow down the hatch. Tiburon is a Belizean rum that is aged for 4 years. It's a decent rum mixer, but not enjoyable for sipping. The major issue with this rum is the price point of $35-$43. For rums in this price class (Diplomatico RE, Dos Maderas 5+5, Ron Abuelo 7 yr), this rum does not deliver an exceptional flavor that is up to par with other rums and is too harsh. I find most positive reviews are enamored by the bottle or that they travelled to Belize. Unfortunately, the good rum of Belize (Caribbean Rum) is not distributed outside of Belize, and costs a fraction of Tiburon. I don't recommend this rum and would not purchase again. However, if you must, I recommend as a mixer only, not for sipping. If you look at the bottle and expect a spiced rum taste...you are in for a surprise! This rum is blended from different aged rums and aged in oak casks, it looks and smells a bit like bourbon. It is great as a mixer and even better as a slow sipper. A nice one, but has a kick to it, too punchy for my liking. Great looking bottle that would be a nice gift. First off, I think this rum is in one of the coolest bottles of all the rums I tried. Frankly that was what caught my eye initially. Glad it worked. The rum is a brilliantly gorgeous golden hue and has excellent legs. I think the rum is STILL clinging to the sides of my snifter. That is saying something. It has a pleasant aroma with no chemical astringency. It is described as being "a molasses base rum aged in old oak bourbon barrels." Their website continues: "We blend rums from a variety of barrels of different ages and character and re-cask the blend for a second maturation process. This is where our Tiburon takes on its golden color and smooth finish and where the oak barrels tend to emphasize the tropical vanilla undertones and oaky accents present in the rum." This explains, in part, the difficulty I have. Upon initial tasting I get a rather negative harshness...but only for a brief few seconds...then my tongue registers not only that oak tones but also a slight molasses sweetness (this isn't a sugared rum, folks). Further sips brings out some vanilla and caramel flavors behind the initial harshness and oak. A borderline burn (I feel it being more of a hard warmth) in the throat. The finish is somewhat dry with the vanilla flavor evident. Overall this is a very good rum albeit a bit intimidating at the outset. But that smooths out quite a bit. To me this indicates this would be best suited in a glass with one ice cube to soften the initial harshness and bring out the background flavors. In my humble opinion this is a borderline sipping rum...those who enjoy bourbon will probably like this straight up. I feel this is an excellent mixing rum. I would have given it an "8" if that initial harshness wasn't present. Perhaps a couple of years more aging would help. All in all, this is a very recommendable and somewhat different rum. Not sugared and very straightforward. First off,the bottle is pretty cool with the shark on it. Then I poured some and was disappointed by the light color. Next I took in the aroma and it was amazing. Finally the first taste and now tiburon small batch is one of my favorites. I picked this up at the Traveller's Rum Factory while I was in Belize. This rum has a surprisingly strong oaky kick to it. I don't get any particular notes past the oak, but I do find this to be a nice slow sipper.